"Celtic, Gaelic, or Anglo-Irish: Which is the Real Ireland?" 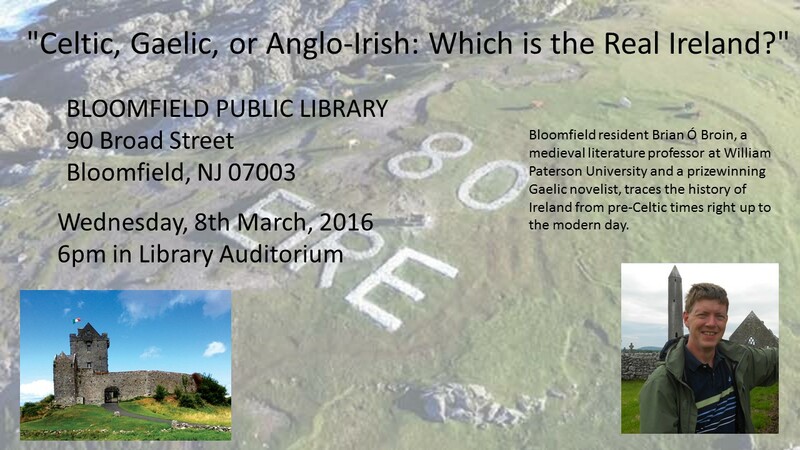 Bloomfield resident Brian Ó Broin, a medieval literature professor at William Paterson University and a prizewinning Gaelic novelist, traces the history of Ireland from pre-Celtic times through the series of invasions that brought Christianity, cities, castles, Gaelic culture and English culture to this mysterious island nation of North West Europe right up to the modern day. Using slides and recordings (and maybe even a song or two!) Professor Ó Broin demonstrates the color, the uniqueness, and the resilience of this modern European country which sent so many emigrants to America, as Ireland faces the challenges and opportunities of the 21st century. Ireland has always been a target of invasion. the Celts invaded Ireland three hundred years before Christ, completely displacing the previous stone-age culture whose mysterious structures, like that of Newgrange, still dot the landscape. Six hundred years of Pagan Celtic culture followed the invasion, and the tribal warrior culture of that period is still visible in surviving Gaelic texts such as the Fenian stories and the Táin Bó Cuailgne. An African-tinged Christian monasticism followed conversion to Christianity, and the monastic sites of this period are still to be found throughout the country, marked by their strange cone-tipped bell towers. Vikings saw easy pickings in these monasteries, and came to raid. They stayed, however, and founded Ireland's first cities, like Dublin, Waterford, and Limerick. The French-speaking Normans followed, bringing in feudal culture from England and France. Finally, the English themselves came, in several catastrophic waves, and still remain to this day in the six counties of Northern Ireland. The other twenty-six counties, however, have been a self-governing nation since 1922, constitutionally enshrining both the Gaelic and English cultures. Ireland is a member of the United Nations, and has been in the European Union since 1973. Helping out a linguistics doctoral student at Rutgers with her project on Irish phonology. Professor Brian Ó Broin is the administrator. You can contact him at obroinb@wpunj.edu. Cuan Ó Seireadáin ag labhairt le micléinn William Paterson University agus Gaeilgeoirí NJ faoi chur chun cinn na Gaeilge. Tabhair faoi deara go raibh duine i láthair go fíorúil freisin ó Ollscoil Pennsylvania. 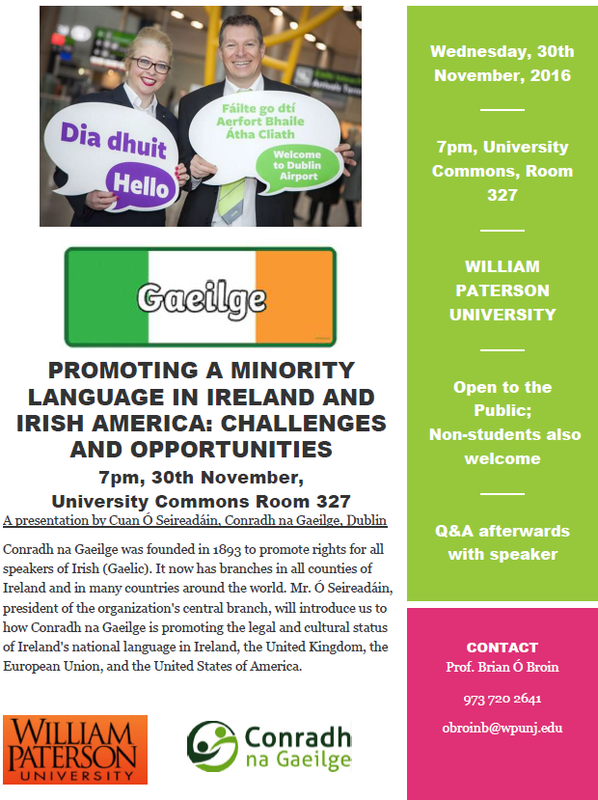 Cuan Ó Seireadáin, representing Conradh na Gaeilge, spoke to William Paterson University Students and some NJ Irish speakers on a recent visit. Note that we also had a virtual attendant from the University of Pennsylvania! We also had visitors from Drew University!